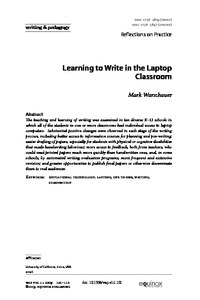 The teaching and learning of writing was examined in ten diverse K-12 schools in which all of the students in one or more classrooms had individual access to laptop computers. Substantial positive changes were observed in each stage of the writing process, including better access to information sources for planning and pre-writing; easier drafting of papers, especially for students with physical or cognitive disabilities that made handwriting laborious; more access to feedback, both from teachers, who could read printed papers much more quickly than handwritten ones, and, in some schools, by automated writing evaluation programs; more frequent and extensive revision; and greater opportunities to publish final papers or otherwise disseminate them to real audiences. The daily use of laptops in our 10 case study schools had a major effect on instruction at each stage of the writing process, including pre-writing, drafting, rewriting, and dissemination. Though the particular way that computers were used was shaped by the nature of K-12 schooling, and especially its emphasis on high-stakes testing, overall student writing in these schools became better integrated into instruction, more iterative, more public and collaborative, more purposeful and authentic, and more diverse in genre, while students’ written products improved in quality and student writing became more autonomous (for details, see Warschauer, 2006, 2008). One-to-one laptop use is not a magic bullet to solve all educational problems, but our study suggests that it has a substantial positive impact on the teaching and learning of writing. Educators who are concerned with promoting the kinds of writing and literacy skills required of 21st century life will do well to prioritize implementing one-to-one laptop programs in their classrooms.